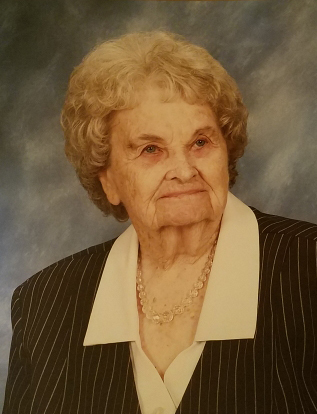 Robbie Jo Newsom Scott, 93, of Albany, GA died Monday, November 5, 2018 at her residence. Funeral services will be conducted Thursday, November 8, 2018 at 11:00 a.m. at Mathews Funeral Home. Rev. Cecil Peterson will officiate. Committal service will follow at 2:30 p.m. at Hopewell Baptist Church Cemetery in Moultrie, GA.
Mrs. Scott was born in Kissimmee, FL to John Byron Newsom, Sr. and Robbie Josephine Fulton Newsom. She grew up in Colquitt County, GA and graduated from Colquitt High School where she played on the basketball team. Before moving to Albany in 1947, Mrs. Scott worked in Chicago, IL at an aircraft manufacturing plant during WWII. Along with her husband, the late Hubert F. Scott, Sr., they owned and operated Albany Cabinet Millworks, Scott Food Store Equipment Company, and she was a self-employed property manager. She was a member of Mercedes Baptist Church. Survivors include her sons, Hubert F. Scott, Jr. “Bubba” and his wife Judy, Tony Scott, daughter, Darlene Scott Olesiak and her husband Dennis, all of Albany, GA, five grandchildren, Darrell Brazil and his wife Janet, Benton, AR, Michelle Patterson, Albany, GA, Jordan Sloan and her husband T.J., Valdosta, GA, Kimberly Scott, Atlanta, GA, Gabe Banks, Alpena, MI, great grandchildren, Brandon Brazil and his wife Mandy, Danielle Brazil, Ariel Patterson, a great-great grandchild Charlotte Faye Brazil and a brother Buck Newsome of Moultrie, GA. The family will be at the home of Bubba and Judy Scott, 4118 Quail Hollow Road, Albany, GA. The family will receive friends on Thursday from 10:00 a.m. until 11:00 a.m. before the service at Mathews Funeral Home. In lieu of flowers, those desiring may make memorials in memory of Robbie Jo Newsom Scott to St. Jude’s Children’s Hospital, P.O. Box 1000, Dept. 142, Memphis, TN 38101-9908.